Scania the positive for Volkswagen; heavy duty the shining light for Volvo. 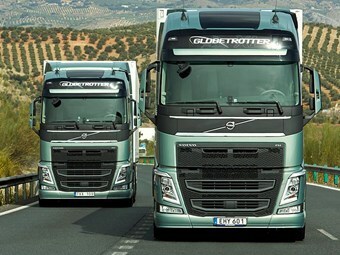 Volvo recorded a rise in heavy duty truck deliveries for the month of September. Volkswagen has announced a slight dip in commercial vehicle sales in the September quarter, with the van arm and MAN Trucks division pulling down the positives of Scania. Delivery van, Transporter and pick-ups sales fell 3.4 per cent to 36,300 vehicle deliveries for the three-month period compared to 2014 and are sitting 1.1 per cent behind last year’s figures to September. "Caddy deliveries fell by 4.6 per cent to 104,500 vehicles (109,600)," Volkswagen says. "The T-series saw growth of 3.1 per cent to 125,100 deliveries (121,400)." "Amarok sales fell by 2.5 per cent to 55,600 vehicles (57,000). "Worldwide Crafter deliveries were up by 2.5 per cent to 36,100 vehicles (35,200)." The news is more alarming for MAN, which has dropped 11.6 per cent this quarter to 9,000 truck deliveries and is running 13.1 per cent behind 2014. The company’s Scandinavian arm Scania bucked the trend, increasing its vehicle movements by 100 units, or 1.3 per cent, to 7,200 for the quarter. However, Scania’s annual outlook matches the rest, with a 2.2 per cent decline on the same nine-month period as 2014. For Volvo, the quarter was a mixed result with a 15 per cent decline in truck orders countered by a 3 per cent increase of truck deliveries to 47,338 and 3 per cent net sales rise on 2014’s quarter. Heavy duty truck deliveries rose 4 per cent to 40,831 vehicles for the third quarter, slightly above the yearly rise of 3 per cent. Medium duty and light duty numbers both fell however, decreasing 1 per cent and 7 per cent respectively. While the drop in the medium market is on trend for the year, the light duty numbers in September fall well short of the 8 per cent growth 2015 is showing on last year. The Volvo brand reported a 55 per cent growth in its medium duty trucks over the quarter, though its total deliveries numbers were down 2 per cent. The UD arm rose 24 per cent in the heavy duty market but dropped 31 per cent and 60 per cent in the medium duty and light duty segments. Renault Trucks rose in all three areas, led by a 40 per cent increase in medium duty truck deliveries, and finished the quarter up 20 per cent in total numbers. Mack Trucks rose six per cent in the heavy duty segment for the quarter and is currently 10 per cent ahead of 2014.